The 3rd Annual World Championship Bass on The Fly Fishing Tournament will again be held May 12th at Lake Fork Marina from 6:00am-2:00pm. This tournament is for fly fishermen and women and participants must use only fly rods & reels, line, and flies made exclusively for fly fishing. There are two divisions. One for boaters who may weigh in 5 fish, that are not within the Lake Fork slot of 16”-24”, to determine their total weight. Boaters may fish individually or as a two man team. There is also a non-boater division for those using kayaks, float tubes, pontoons or fishing from the bank. Non-boaters must photograph and release their fish. The cumulative length of their longest five fish will be tabulated to determine the winner of this division. There will be a cash payout determined by the number of participants in each division. The entry fee is $55 per person and last year first place in the boater division paid $500 and in the non-boater division first place paid $168. The entry fee includes a big bass pot for each division and there is an optional big blue gill pot. A club team trophy will again be up for grabs which has generated some heated competition between the Ft. Worth Fly Fishers and the Dallas Fly Fishers club. In addition, there will be a casting contest for the longest distance and another one for casting accuracy, using a bass bug. Winners will receive a rod & reel outfit. There will also be numerous drawings for prizes and a goody bag which features Skeeter t-shirts and Buff headgear. Free fly casting classes will be offered hourly Friday 10:00am – 4:00 pm and Saturday 9:00am – Noon. There will also be free Kayak demonstrations and vendors on site both days. The public is invited to come out and learn more about fly fishing and the fun of kayaking. Last year, there were 33 participants despite the severe thunderstorms Friday evening. Ted Warren, the organizer, says fly fishing is like bow hunting for deer. It requires more knowledge, skill and stealth than conventional tackle fishing. Though not large compared to some bass tournaments, the tournament has steadily grown and Warren expects around 45 fishermen and women this year from Texas, Oklahoma and Louisiana. 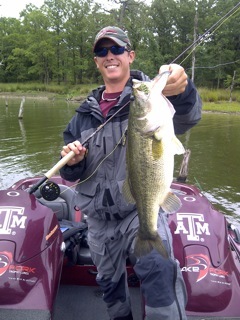 The rules and official registration forms can be found at most Lake Fork area shops or online at www.bassonthefly.org. Forms can be mailed to Bass on The Fly, P.O. Box 173, Yantis, TX 75497. Onsite registration will be open Friday 10:00am – 9:00 pm and Saturday 5:00am-6:00am. All participants must check in at the tournament site before 6:00am Saturday. This tournament is endorsed by the Federation of Fly Fishers – Southern Council.